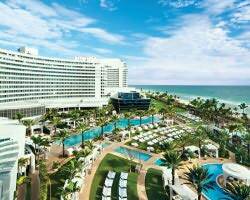 22 Jun TURNBERRY ISLE RESORT STAY & PLAY $237 PER DAY! If you have been thinking about a visit to Turnberry Isle Resort, now is the perfect time to come and enjoy the resort’s luxury and amenities with this popular 2-night package! Take a look below at all the amenities included in this Stay & Play. Secluded on 300 tropical acres, The Turnberry Isle Miami Resort boasts 392 luxurious rooms and suites with spectacular views, private balconies and upscale amenities. The two highly-rated resort golf courses provide excitement and challenge for golf enthusiasts of all skill levels. Get pampered in the award-winning Willow Stream Spa, a true oasis of serenity, or unwind by the pool surrounded by lush gardens. Prices are based on two golfers in a Deluxe Resort View Room (king or two double beds). Additional golf can be added and extra nights available.